Sultry climes, a captivating history and enticing scenery: welcome to South Carolina y’all. 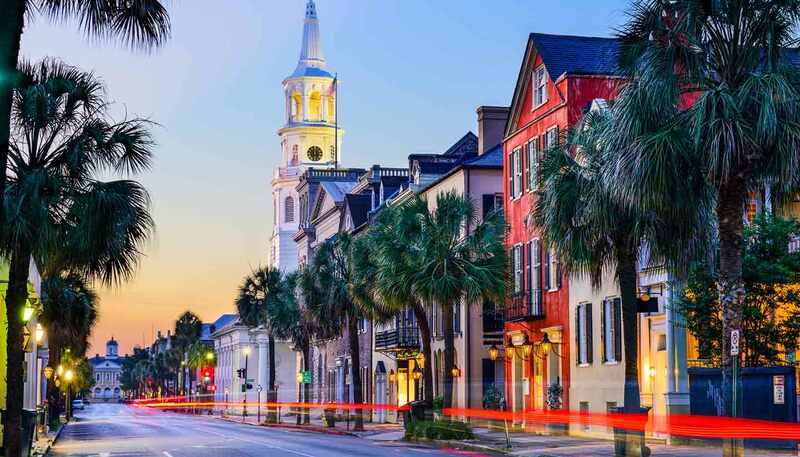 The ‘Palmetto State’ is blessed with stunning landscapes – from the rolling hills of the Upcountry to the glistening lakes of the midlands – but it’s the coastline that lures most visitors. Plant your parasol on the sun-drenched shores of Myrtle Beach for classic seaside fun, with boardwalk amusements, boogie boarding and boat tours all up for grabs. The city is also home to the South Carolina Civil War Museum, which tells the story of the conflict through the eyes of the state. Beaufort on Port Royal Island is easy on the eye thanks to its raft of beautifully restored antebellum homes. But if you’re looking to escape the cities, take a trip to Hilton Head, a narrow barrier island that’s generously clad with beautiful beaches, unspoiled forest and world-class golf courses. With its lack of skyscrapers and bevy of 19th-century mansions, the coastal metropolis of Charleston is anything but an identikit US city. It’s the site of the country’s first permanent European settlement and today crackles with a stellar dining scene, characterful boutique hotels and Southern charm aplenty. Away from the coast, South Carolina’s back roads offer visitors the chance to pick juicy peaches, explore rambling plantations and encounter Revolutionary and Civil War sites and re-enactments. Beyond that take in the terrific museums of the state capital, Columbia, waterski across Lake Murray, or paddle through Congaree National Park’s murky creeks and hardwood forests. And don’t leave without visiting the foothills of the Blue Ridge Mountains, where you can hike and bike to your heart’s content. 80,782 sq km (31,190 sq miles).